Back around the turn of the Millennium, Rhino issued a set of compilations titled The Postpunk Chronicles. The three-disc series followed up on the label’s previous DIY, Just Can’t Get Enough, and Faster & Louder collections, offering meticulously curated snapshot of a bygone scene accompanied by detailed liner notes. Despite the title of the series, postpunk — as per the commonly understood meaning of the genre tag — was only part of the package. The individual installments weren’t short on spiky, minimalist odes to emotional detachment and political alienation, but those tracks were rounded out by scores of other jams pulled from the “college radio” playlists of the Eighties. Postpunk, synthpop, melodic indie rock, and “Paisley Underground” fare were tossed into the over-the-counter version of the mixtapes mopey undergrads used to circulate during ancient times. I bought all three discs when they first came out, mainly because I’m a sucker for one-stop omnibus jobbers of familiar and new-to-me material. The former rekindles (or reinforces) my love and also greases the rails for the latter, setting up new avenues for exploration and discovery. The set has seen some pretty heavy rotation over the past twenty years, and mp3 rips of the comps occupy a permanent place on the jump drive where I keep a small stash of “essential” albums for listening-on-the-go. They’re exactly the type of thing that I’d play the hell out of on my turntable, the epitome of “drop the needle and drift away” listening, but they — like the rest of Rhino’s Nineties punk/wave comps — never saw a vinyl release. So I did the next best thing and sought out the single versions of my most favorite tracks from the set. Along with some Nineties Era techno jams, they marked the initial stage of my single-buying mania — and, like those dance mixes, I picked up the 12-inch versions because they were easier to shelve than 7-inchers at the time. 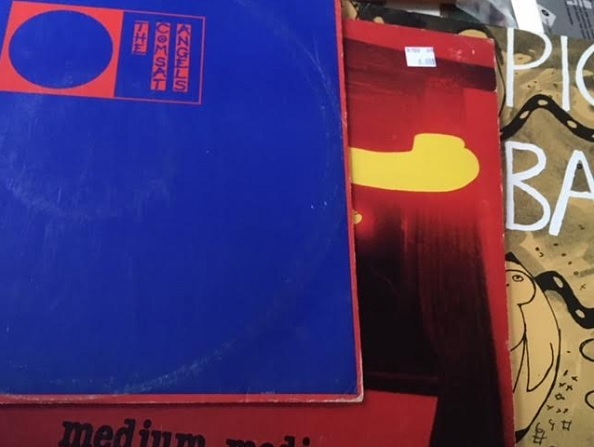 The process is still ongoing (see: the Modern English 12″ with “Gathering Dust” and “Smiles and Laughter” I bought last weekend) but the inaugural wave consisted of three must-haves which have been getting frequent play over the past few months. The Comsat Angels – “Eye of the Lens” – This exercise in mopey paranoia is one of the best postpunk tracks ever recorded. It’s definitely the finest work by the Angels, who gradually mutated into an Big Pop embarrassment by the mid-Eighties. Medium Medium – “Hungry, So Angry” – Postpunk dance funk — dig that sax and slap bass — with a title/chorus that has joined my litany of internal mantras. Pigbag – “Papa’s Got a Brand New Pigbag” – According to my wife, this instrumental jam sounds like the music a group of devils would play in a black and white cartoon from the 1930s — and that’s precisely why I adore it.